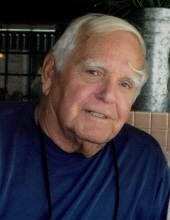 John E. Bauer, 90, of Mansfield passed away January 27, 2019 at his home. John was born October 4, 1928 in Mansfield to Stephen and Elizabeth Gerger Bauer. John graduated from Mansfield Senior High School in 1947 and was employed by Westinghouse Electric for 37 years. He was a member of St. Peter's Catholic Church, and served in the United States Army being recalled twice during the Korean War. John and his wife enjoyed going to Clearwater, Florida for 35 winters where they shared a second home, opened a gift shop and took boarding photos on Starlite Cruise Lines. He was a good, generous, hard-working man who always puts his family and responsibilities first. He was highly respected by those who knew him. John is survived by his wife of 69 years, Helen Comisford Bauer; son Chris (Jennifer) Bauer; six grandchildren. In addition to his parents, he was preceded in death by his son Michael J. Bauer; sisters Eva Uhde, Margaret Dalenberg. Friends may call at Herlihy-Chambers Funeral Home, 173 Park Avenue West, on Friday from 10:00 - 11:00am. A funeral service will be held at the funeral home at 11:00am with Fr. Austin Ammanniti officiating. Military honors will then be held by Richland County Joint Veterans Burial Detail. Burial will follow at Mansfield Catholic Cemetery. In lieu of flowers, memorial contributions may be made to Hospice of North Central Ohio or charity of your choice. To send flowers or a remembrance gift to the family of John E. Bauer, please visit our Tribute Store. "Email Address" would like to share the life celebration of John E. Bauer. Click on the "link" to go to share a favorite memory or leave a condolence message for the family.